Following a long sojourn in France, Holcroft Blood has returned to England and is now a Lieutenant in His Majesty's Ordnance. With civil unrest looming everywhere, Blood is soon busy defending the realm against those who wish to see King James II deposed. 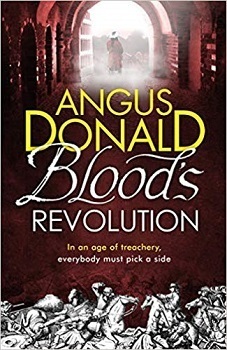 Against a backdrop of religious, and political, strife, Blood finds that his return to England is fraught with danger, not just because his role in the Ordnance sees him in the thick of military action, particularly at the Battle of Sedgemoor, but there is also a shadowy figure from his past that seems hell bent on causing Blood's destruction. It's been really interesting to discover just how Blood has progressed in the fifteen years since we last knew him. No long working as a spy, Blood is very much his own man and whilst his work in the Ordnance is dangerous, there is always something which fires Blood's imagination and, as before, he is not one to take orders easily. This independent spirit will see him in grave danger as he tries to keep one step ahead of those who wish to do him harm. However, Blood is a worthy hero, superbly flawed, of course, but with a real sense of honour and a genuine desire to do the right thing. It was interesting to discover a little more of Blood’s character particularly in his personal relationships, which are covered in a little more detail in this story. The author writes this type of historical adventure very well, and in using historical fact cleverly combined with fiction, the age of treachery comes alive in the imagination. The difficulties of living in such a unpredictable time politically is highlighted, as is the ambiguity and growing dissent which surrounded the reign of this very Catholic King. Even though the story ends at the conclusion of the Glorious Revolution in 1689, I feel sure that this is not the end of Blood’s story. I look forward to seeing where his adventures will take him next. Labels: Bonnier Zaffre, Book Series, Hist Fic Saturday, Historical Adventure, Historical Fiction.